For your home gym or CrossFit box, it’s crucial for any gym owner to invest in a good timer. A good gym timer allows you to focus on your workout without fiddling with a watch or dealing with your phone when you’re out of breath. There are a few options on the market, so doing a little research about the right CrossFit timer for you is a good idea. 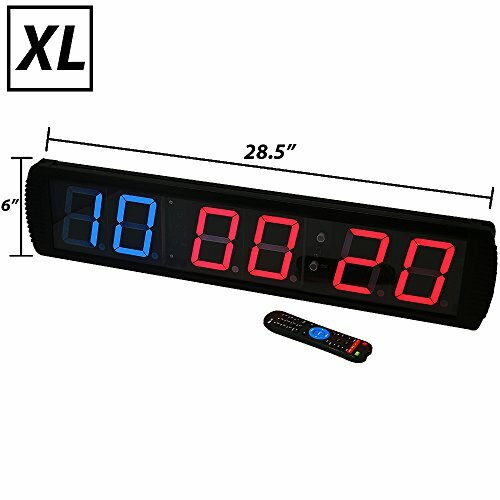 Here’s a bit about CrossFit timers and some of the best fitness clocks available. 2 What Is Crossfit Timer? A CrossFit timer sits on the wall of your facility or home gym and, well, times your workouts. The best ones come with multiple functions, allowing you to count up, count down, do clocked repeats, or even do intervals like Tabata. CrossFit timers are standard in almost any CrossFit box and eliminate the need to track scores or WOD times on your cell phone or a stopwatch. Each CrossFit timer will come with a set of instructions. Coming from a guy who usually throws the instructions away because “I can figure it out on my own”, I’d recommend you hang onto these. Why? Well, the best options on the market come with a ton of features. They also come with remotes that have many buttons on it that require some explanation. Life will be simpler if you know how to do things with it like set interval timers. For example, the Rogue Echo timer has a FGB button on it, which stands for “Fight Gone Bad”. In this case, one click of a button programs three 5-minute rounds, with a beep at the end of each minute and a rest between rounds. Having a CrossFit timer for your gym alleviates the hassle of having to time workouts on your phone or with a watch. You’ll be distracted less throughout a workout and may even get a better time on a WOD because you aren’t taking two steps forward to squint at your phone in the middle of a set of kettlebell swings or pull-ups. Price– Good gym equipment is never cheap. Even the cheapest timer costs over $150, so be prepared to shell out a few bucks if you’re buying a new one. Warranty– Check to see how long your clock’s warranty lasts, and what they’ll replace it for in the event of an accident or malfunction. 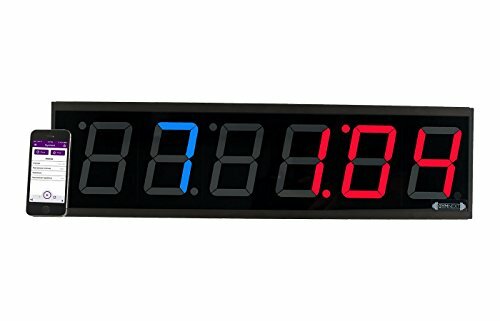 Display– You’ll want to buy a timer with a bright LED display that’s at least 4” so that it’s visible from across the gym. Can You Buy It Used?– Sadly, the surge in CrossFit boxes opening across the country makes it hard for every gym to stay open. There may be a gym in your area selling off fitness equipment. You may be able to get a used timer from them a little cheaper. Here are 3 of the best CrossFit timers available, as well what buyers have said about them. Like Rogue does best, another piece of high quality equipment with a pretty heavy price tag to boot. Rogue is known for their quality, and reviewers say the brightly lit screen and any functions of the timer make the steep price tag worth it. A few reviews mention they had to replace the remote after a few months. Other than that, most gave the Echo timer a great rating. 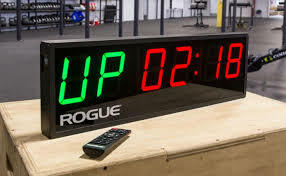 Along with the Rogue Echo, the Flex Timer is the most commonly seen fitness clock inside CrossFit boxes. It’s also the most expensive, but many of the reviewers who own gyms say that it’s worth the price tag. The flex timer connects to it’s own app, so you have the choice of using the remote or your phone to control it. That said, if you’re looking for something for your home gym, there is probably a cheaper solution available that can do the same job. The budget pick of the three options available, this timer comes with an array of countdown settings useful for CrossFit (Tabata, EMOM, count up/down, and the standard stopwatch). Some reviewers say that they wish the beeps were louder so it can be heard across the gym. Probably the best option for a home gym if you’re on a budget. Buying a CrossFit clock for your home gym or box is an investment. Having a good gym timer allows you to focus more on your (or your client’s) training without having to fumble with stopwatches or cell phone timers. Still, do your research before buying and look at all of your options. They aren’t the cheapest piece of equipment you’ll purchase, but they are an integral part of any CrossFit gym and a useful piece of equipment for your garage.